Notes: Based on the light novel of the same name written by Honobo Yonezawa, published by Kadokawa Shoten. It is the first in a series of books called Classic Literature Club, and is based primarily on it. A manga adapation illustrated by Task Ohna started in the March 2012 issue of Shonen Ace, also published by Kadokawa Shoten. Hotaro Oreki doesn't like to do things that he considers a waste of energy. However, things start to change when he is encouraged by his older sister to join the Classics Club so that it won't get disbanded. Unknown to him, another student Eru Chitanda already planned to join; but instead of being free from club obligations, Hotaro joins - unable to refuse Eru's passionate gaze of curiosity. Together with his friends Satoshi and Mayaka, they began to discuss a variety of mysteries in school that only Hotaro seems to be able to solve; including the mystery that lingered on from Eru's childhood memory. I do not know why mystery shows almost always feel need to be outrageous. There is something almost academic about murder mysteries because it is almost impossible to relate to one. Even those of you who have been unfortunate and have personal experience with murder are not likely to have experience with the kind of deaths that exist in the worlds of Poirot or Holmes. People don't die in locked rooms, in isolated places, and that is mainly because it is an extremely stupid way to kill someone. The problem I have with mystery shows in general (as much as I like them for their brain teasing quality) is that they are not relatable because of their outrageous premises. Even the wonderful Moryo no Hako lacks reality at the core of its mystery. It is impossible to relate to and the characters only achieve the emphatic quality they do independent of the core mystery. Now, this is where Hyouka comes in. Hyouka is a mystery show like many others but unlike many others there are no murders, there are no grand thefts or supernatural happenings to stimulate it into life. No, Hyouka is about sometimes deep, sometimes trivial but always personal mysteries cropping up in the lives of its main characters and the efforts they go to solve them - whether it be a half-forgotten memory that bugs them or an odd Tannoy announcement that piques their curiosity. Hyouka is a show about curiosity and that theme runs richly and deeply throughout its entire runtime. I admire this. Shows like Gosick and Un-Go never felt cohesive in that same way; the mysteries and the stories of each show always felt incongruent as if they were there for their own sake and not to further the characters or themes in any serious way. In Hyouka the mysteries felt like they were more than just brainteasers and that is the way it should be, in my opinion anyway. 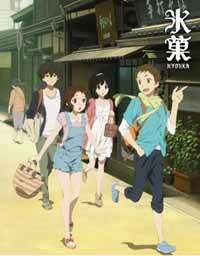 That all said Hyouka is more than just a justification for my opinion. It is a really good show too. At its base aesthetic level, Hyouka is a gorgeously drawn and beautifully animated show - the character designs are simple but varied, sparkling, cute and expressive and the setting has so much personality in its warm and rustic glow that we understand it without being told too much about it. Kyoto Animation makes a lot of very engaging shows in a visual sense (even if only in that sense) but this is probably their most beautiful series and that is a serious compliment. The characters are also realised as incredibly well through the script as they are realised visually. The show defines the relationships between the four main characters through intelligent dialogue which gradually changes as the characters progress. Given that some of the episodes are almost spent entirely in dialogue with at least one episode being set entirely in the characters' club room; the wit and banter of the characters as well as the effectiveness of the show's mysteries are all that are there to keep us interested (visuals aside). The characters themselves - namely Hotaro, Satoshi, Mayaka and Chitanda - slip past all the standard stereotypes that you could possibly expect. From the synopsis, I had feared that Hotaro would be one of those boring protagonists without any life or will of their own apart from those attributes that the plot requires of them. Hotaro is not like this. Even though he never puts any effort into anything (or so he claims), he is not someone who is solely acted upon by those around him. His rather dynamic attempts to avoid doing anything on top of his laconic wit make him an enjoyable character to watch and you almost feel sorry for him when his attempts at "energy conservation" are thwarted. Eru is the heart of the show however. Her earnest curiosity and simple persona allow her to drive the show but her complex character and demonstrated intelligence mean she is more than just a plot device. The others are also as fleshed and vital, as shown in arcs of the series I do not want to spoil for you here, and this quality even stretches to the side characters - even the ones with minimal screen time are surprisingly distinct and memorable. As much as I like Hyouka, there are some problems. While some of the mystery arcs are, to be frank, fantastic and some of the best mystery anime has to offer, a fair number of the one-off episodes are pretty dull and obvious from a mystery perspective. While they still entertain thanks to the shows strong cast and writing the show's thematic strength and interest is so intrinsically tied to the mysteries it explores that I spent most of my time during those episodes waiting for them to end so I could get into the next multi-episode mystery. I would likely have enjoyed them more if I had not seen how much better the show could be. This is also tied to the problem of pacing that plagues the show. The fact the show is based on a series of novels is very apparent in that the show does not feel unified over the course of the twenty-three episodes, the show does not end with a strong sense of conclusion in either thematic or narrative terms and it makes the whole experience less satisfying than it really should be (until they make more episodes that is). Overall Hyouka is a top-class show. It brings something new to the table in terms of mystery and it is well-written and beautifully realised. At least half to two thirds of this show is exceptional but sadly that remaining portion does drag it down to the point that I cannot give it my most enthusiastic endorsement. That said, I do recommend it. Recommended Audience: Kyoto Animation seems to have made it their mission to create the least offensive anime around and Hyouka might just be the least offensive of the lot. I can't say it is for children though because of its slow, thoughtful pace and often melancholic undertones but it is absolutely fine for teenagers or above.